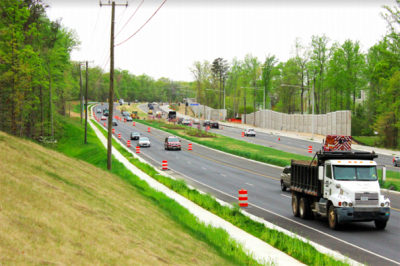 A. Morton Thomas and Associates Inc. (AMT) was the lead engineer and designer for a major realignment of a 3.68 mile stretch of U.S. Route 1 from Telegraph Road to Mount Vernon Memorial Highway in Fairfax County. The project involved keeping the road open for 40,000 vehicles a day; building twin two-span bridges over the Accotink Creek Flood Plain; utility relocation along the entire stretch of road; moving an historical building; relocation of 100 property residents during construction; installing several wildlife crossings; and installing more than 200 drainage structures. A parallel pedestrian and bicycle lane was built along the entire length of the realignment; new traffic signals were installed and a 32-foot median was created for future transit needs. Collaboration between federal, state and local agencies, residents, contractors and designers was key to achieving better traffic flow, safer infrastructure and an overall better quality of life. 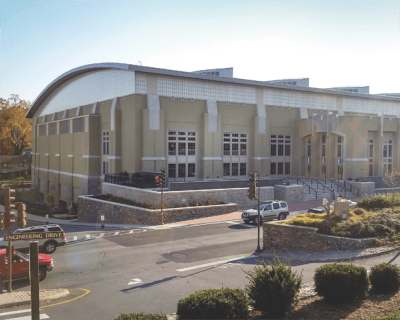 Draper Aden Associates implemented 12 major stormwater controls for VMI’s new Corps Physical Training Facility which was built over the Town Branch Creek. While most projects call for only one or two stormwater management controls, Draper Aden had to do much more because of the location of the Training Facility over the Creek, which often flooded. The controls include some very inventive solutions such as a vegetative roof, bioretention ponds, underground cistern, rainwater harvesting system, manufactured BMPs and more. Flooding from Town Branch Creek was reduced not only on the VMI Post but also in adjoining neighborhoods. In addition, rainwater was collected for use in the building’s cooling system and water runoff was filtered before it entered the Creek. Gannett Fleming faced huge challenges when it undertook the replacement of the 1940s era Norchester Pump Station in the Hampton Roads Sanitation District. A new station was needed to prevent failure of the sewage system. 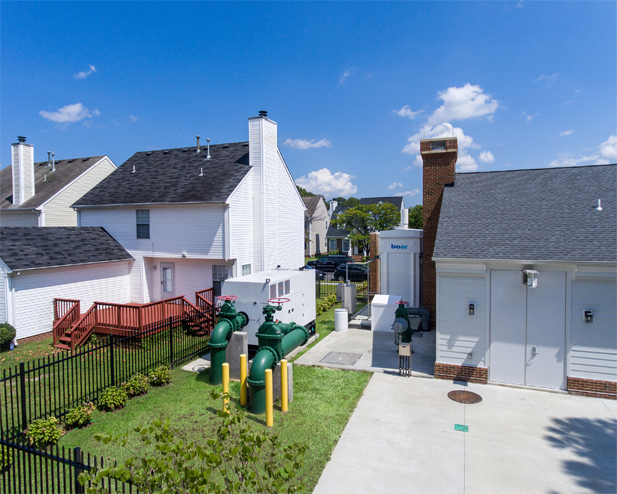 Topping the list of challenges: the site for the Pump Station was only 62 feet wide and was located in the heart of a residential neighborhood, in fact just seven feet away from neighboring homes. Gannett Fleming designed a beautiful home façade to conceal the sewer infrastructure so that the pump station looks like any other home in the subdivision. A second major concern was preventing bad odors from the pump station. Smell was minimized by an advanced odor control system. Vibration monitoring was used to address a third major concern…neighborhood disruption…and the design team had real-time data allowing up-to-the-minute decisions to minimize residential disturbance. 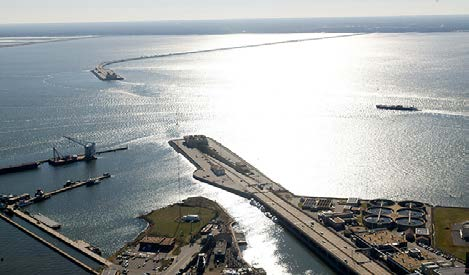 RK&K led a study for the Supplemental Environmental Issue Statement (SEIS) on four alternative routes to expand the I-64/Hampton Roads Bridge Tunnel, one of the largest NEPA studies ever undertaken by VDOT. This broad-reaching study was required before widening the Hampton Roads Bridge to relieve congestion along I-64, I-664, I-564 and VA 164 in the Hampton Roads region which suffers some of the most severe congestion on the East Coast. RK&K managed all engineering and environmental studies, and involved staff from its Richmond, Baltimore, Fairfax, Virginia Beach and Orlando offices. The study involved: coordination with multiple localities and regulatory agencies including the U.S. Army Corps of Engineers; many presentations to localities and boards; monthly meetings with regulatory agencies and localities; notification to more than 60 agencies, 1,400 property owners, and 143,000 local addresses; six public meetings/hearings; and responses to more than 600 written comments.